Average soil. Avoid dry, sandy sites. Very popular and long blooming. Spreads easily but not invasive. Prefers cool roots so a summer mulch is good. The Harebell (also known as Carpathian Harebell) is one of the most dependable and delightful species of the bellflowers (Campanulas). 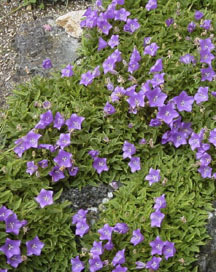 It forms neat clumps of foliage 4 to 6 inches tall. Wiry 6 to 8 inch stems rise from the clumps and are topped by 2 inch flat cupped blue or white flowers. The bloom period is very long extending from early summer to mid fall. They are an excellent choice for the front of the border and quite often bloom the first year. Harebells are relatively undemanding. They are widely tolerant of soil type as long as it is not soggy or extremely droughty. They will grow in full sun to partial shade. Plants should be spaced 10 to 12 inches apart. Division is needed only every third or fourth year and is best done in the spring.